Launcher 1.9.9 Free Download - Launcher is an easy-to-use personal shortcut manager to launch all file kinds. Launcher is an easy-to-use file and application shortcut manager that can launch all kinds of files and programs. 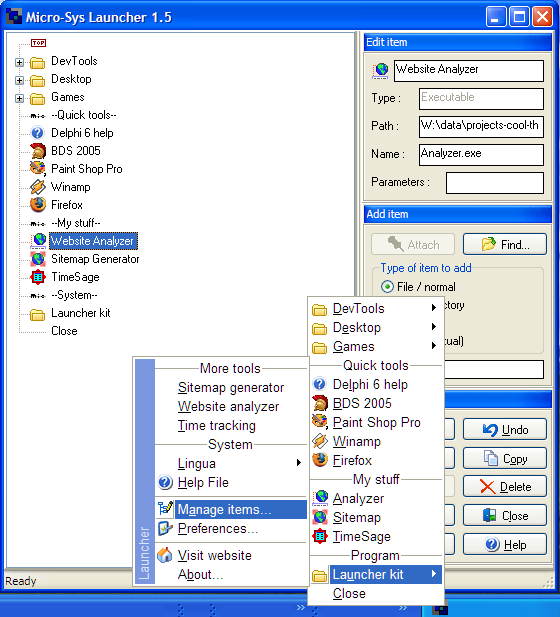 Drag-and-drop operations are supported when editing items shown in the Launcher &quot;open and launch&quot; menu in system tray. Create an unlimited amount of user defined sub-folders and item shortcuts to documents and applications. Create shortcuts by dragging files from e.g. Windows Desktop and Windows File Explorer followed by dropping them into the Launcher &quot;Manage Items&quot; configuration window for menus and shortcuts. Launcher resides in the system tray per default to allow for quick launch of all favourite programs and often used files. Launcher also supports various user interface options, e.g. customizable program font setup including type and size. Statement: First, please download the orginal installation package by clicking the download link. Of course you may also download it from the publisher's website. Using Launcher crack, key, patch, serial number, registration code, keygen is illegal. The download file hosted at publisher website. We do not provide any download link points to Rapidshare, Hotfile, Depositfiles, Mediafire, Filefactory, etc. or obtained from file sharing programs such as Limewire, Kazaa, Imesh, Ares, BearShare, BitTorrent, WinMX etc. Software piracy is theft. If you like Launcher please buy it.